Enjoy an Archery session, Crossbow Shooting, Axe Throwing and Archery Battlefield Combat in a relaxed environment with expert tuition; or discover the hidden secrets of the New Forest during a unique, ecologist-led wildlife walk. For more details, ring 07752 30 20 10. 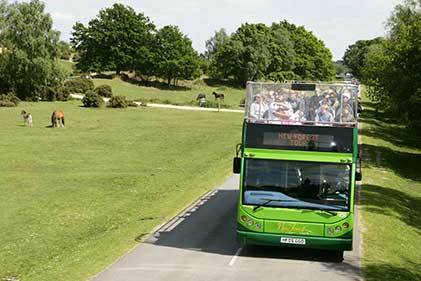 Take a ride on a New Forest Tour open top bus and see the National Park in style. Tours run daily, usually from the end of June or early July to early or mid-September, and offer a choice of three routes that, on the same ticket, enable passengers to hop on and off wherever they wish, switch between routes and take their cycles along, too. The red route passes through Lyndhurst and takes in Burley, Ringwood, Fordingbridge, Godshill, Brook, Cadnam and Ashurst. The green route also passes through Lyndhurst and goes on to Brockenhurst, Lymington, Beaulieu, Exbury and Hythe. The blue route visits Brockenhurst, Lymington, Milford-on-Sea, Barton-on-Sea, New Milton and Burley. The tour buses link with many places of interest and a wide range of walks and cycle rides, including ten Lyndhurst Walks, four Brockenhurst Walks and most of the New Forest Cycle Rides. Further details can be found on the New Forest Tour website, including information about routes and fares. Moors Valley Country Park and Forest - a little outside the National Park boundary - offers a wide range of activities for those who enjoy the great outdoors, including Go Ape, the UK's No. 1 forest adventure, and lots more to do that will keep children happy and entertained. Barbecues and the great outdoors are just made for each other. A family activity, particularly for those with young children. Steam engines regularly thunder across the New Forest. Wide, open grassy spaces are ideal for simple relaxation, kite flying and ball games. Check out the location of some of the best in the New Forest. Cricket pitches offer the opportunity to watch local teams pit their wits and skills against others from around the area as bemused ponies often look on. Hill-top viewpoints provide wonderful experiences for those who appreciate the scenery. The nearby coastline offers attractive walks, whilst sandy beaches are not too far away. New Forest streams invariably provide an ideal environment for short strolls and longer walks. This selection of Forestry Commission car parks can be used as start points for many walks in the woods - along gravel tracks or lesser pathways. New Forest golf courses are often shared with the local ponies and cattle. Experience some of the best river fishing in England, or visit local ponds and lakes. The nearby coast offers unforgettable sea fishing from shore and boat. An ever-popular New Forest activity, horse riding can be enjoyed singly, with friends or family or in larger groups using ponies available to hire from local stables. Fully staffed 110m sea water pool with inflatable obstacle courses, water zorbs, stand up paddle boards, kayaks, aqua jousting and much more. Indoor pools are attractive for children whilst gyms, sports halls and squash courts provide facilities that are perhaps best appreciated on duller days.